The article by Dr Goel highlights atlantoaxial subluxation in association with long segment fusion of subaxial cervical spine. The authors deserve credit again for drawing our attention to a fairly uncommon association. The work done by this group on understanding the pathogenesis of this condition is well known to all. In the article, the authors raise a proverbial 'chicken and egg' question- is the atlantoaxial subluxation the primary problem and the subaxial cervical fusion secondary to that, or is that the subaxial fusion is the primary event causing adjacent level subluxation at the atlantoaxial level? The authors clearly indicate their preference for the former sequence of events. 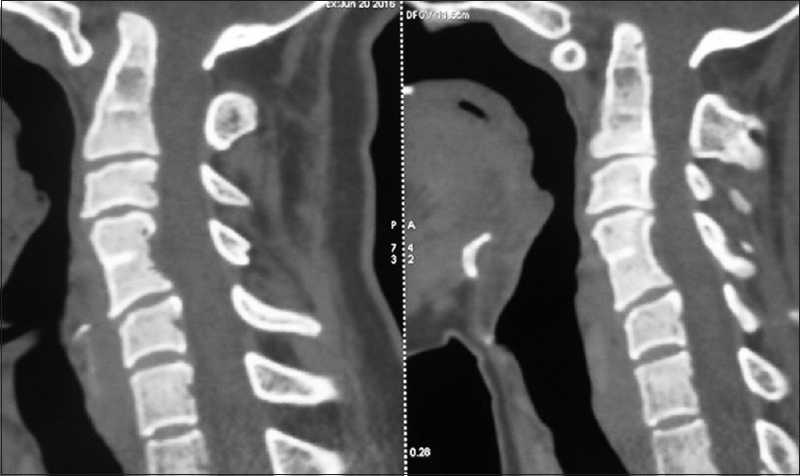 It may be worthwhile to question what causes cervical fusion. The authors allude to the answer--failure of segmentation in the embryonic period. Now we know that the somites are derived from paraxial mesoderm, and the sclerotome of this mesoderm forms the vertebral body. One of the etiological factors responsible for the congenital fusion of cervical vertebra (CFCV) is disturbance of normal segmentation caused by abnormalities in blood supply typically between the 3rd and 8th week of embryonic life. Malformation of the chorda dorsalis is one of the causes of CFCV., We also know that retinoids are one of the key factors responsible for the genesis of abnormalities in the axial skeleton,, and their effect on the formation of the vertebrae is via regulation of the Hox gene., Some studies suggest that decrease in local blood supply is responsible for the CFCV. Whatever be the exact mechanism, there is little doubt that failure of segmentation controlled by a number of environmental and genetic factors is responsible for CFCV. Pax 1 gene with Pax 9 gene control fusion between the first and second cervical vertebrae, and between the 4th and 5th cervical vertebrae. The Meox 1 gene , and the Cyp26b1 gene  have been shown specifically to cause vertebral body fusion. Therefore, it is without debate that the process of embryonic segmentation is a genetically controlled phenomenon with minimal environmental influences, and that this occurs around the 8th week of gestational age. 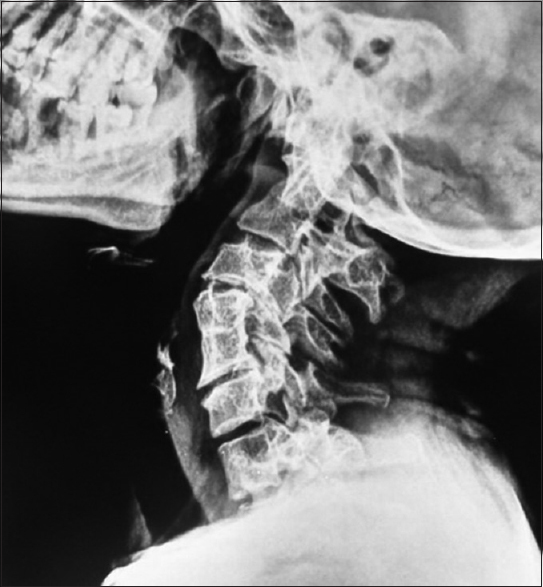 The question raised correctly in this thought-provoking article is this- what are the acquired causes of fusion in the cervical vertebrae? We know that infection, trauma, and surgical intervention on the intervertebral disc may cause acquired fusion of the vertebrae in the cervical vertebrae (AFCV). If indeed the atlanto-axial subluxation were to be the primary event, this would also be a cause of vertebral fusion (acquired). Let us now ask a more fundamental question-is there any anatomical difference between CFCV and AFCV; in other words, can we tell whether the fusion is congenital or acquired by studying the vertebral configuration? The answer is provided in an excellent treatise by Rajendra Kumar et al. 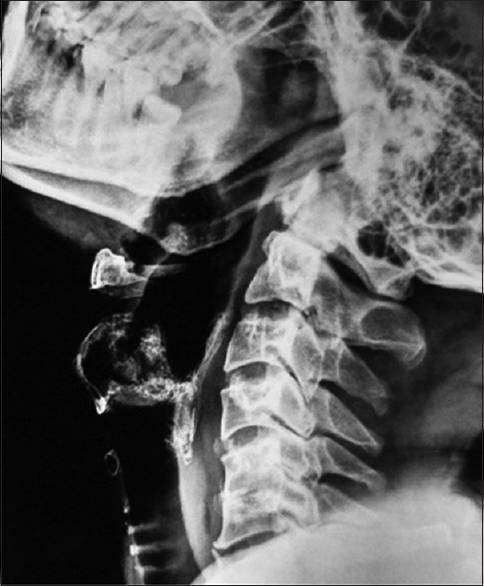 In congenital fusion, the height of fused bodies equals the sum of the heights of the involved bodies and the intervertebral discs between them [Figure 1] and [Figure 2]. In acquired vertebral fusion, this dimension is less than in the case of congenital fusion. A “waist” is often seen at the level of the intervertebral disc between the fused segments in CFCV. This finding is usually absent in an acquired vertebral fusion [Figure 3] and [Figure 4]. The intervertebral foramina of block vertebrae become ovoid and narrowed, and this is not seen in acquired fused vertebrae. Also, the anterior and posterior border scalloping seen in acquired fused vertebrae is never seen in the congenital group. The authors who are world renowned in this field, would, therefore, be well advised to relook at the anatomical configuration of the fused vertebrae in their cases, and this would help them answer the question they themselves raise-about whether the chicken preceded the development of the egg? 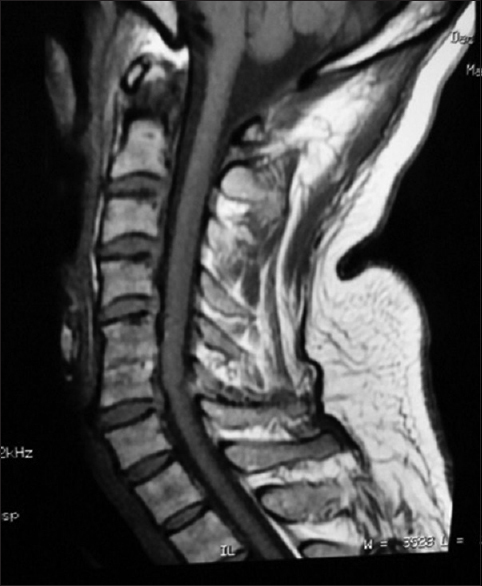 Shah A, Kaswa A, Jain S, Goel A. Atlantoaxial instability associated with pan cervical vertebral fusion: Report on management of 4 cases. Neurol India 2018;66:147-50. Gadow HF. The evolution of the vertebral column. Cambridge University Press 2014. Erdil H, Yildiz N, Cimen M. Congenital fusion of cervical vertebrae and its clinical significance.J Anat Soc India 2003;52:125-7. Saraga- Babic M, Saraga M. Role of the notochord in the development of cephalic structures in normal and anencephalic human foetuses. Virchows Arch A Pathol Anat Histopathol 1993;422:161-8. Sakai Y, Meno C, Fujii H, Nishino J, Shiratori H, Saijoh Y, et al. The retinoic acid-inactivating enzyme CYP26 is essential for establishing an uneven distribution of retinoic acid along the anterio-posterior axis within the mouse embryo. Genes Dev 2001;15:213-25. Kashyap V, Gudas LJ, Brenet F, Funk P, Viale A, Scandura JM. Epigenomic reorganization of the clustered Hox gene in embryonic stem cells induced by retinoic acid. J Biol Chem 2011;286:3250-65. Wellik DM. Hox genes and vertebrae axial apttern. Curr Top Dev Biol 2009;88:257-84. Wellik DM, Capecchi MR. Hox10 and Hox11 are globally required to pattern the mammalian skeleton. Science 2003;301:363-7. Mallo M, Wellik DM, Deschamps J. Hox genes and the regional patterning of the vertebral body plan. Develop Biol 2010; 344:7-15. McGaughran J, Oates A, Donai J. Mutations in Pax1 gene may be responsible for Klippe-Fiel syndrome. Eur J Hum Genet 2003;11:468-74. Soshnikova N, Dewaele R, Janvier P, Krumlauf R, Duboule D. Duplications of hox gene clusters and the emergence of vertebrates. Dev Biol 2013;378:194-9. Jukkola T, Trokovic R, Maj P, Lamberg A, Mankoo B, Pachnis V, et al. Meox1Cre: A mouse line expressing Cre recombinase in somitic mesoderm. Genesis 2005;43:148-53. Abu-Abed S, Dollé P, Metzger D, Beckett B, Chambon P, Petkovich M. The retinoic acid-metabolizing enzyme, CYP26A1, is essential for normal hindbrain patterning, vertebral identity, and development of posterior structures. Genes Dev 2001;15:226-40. Mardani Mohammed, Borujeni MJS, Esfandiary E. Congenital fusion of cervical vertebrae: A review on embryological etiology. Rev Clin Med. 2016;3:148-53. Kumar R, Guinto FC Jr, Madewell JE, Swischuk LE, David R. The vertebral body: Radiographic configurations in various congenital and acquired disorders. Radiographics 1988;8:453-85.